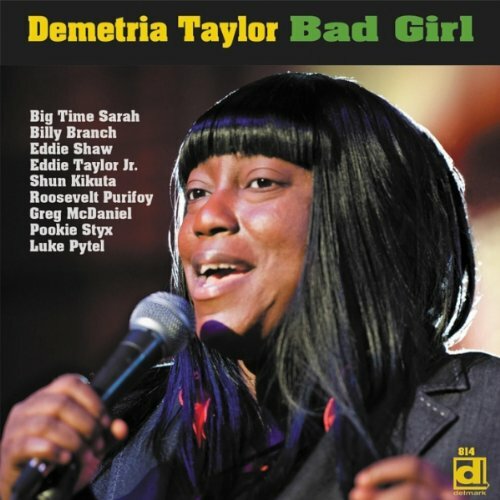 Demetria Taylor’s musical credentials are unassailable – she’s the daughter of Eddie Taylor, one of the (largely unheralded) architects of Chicago blues. As guitarist for Jimmy Reed, Taylor helped to establish the twelve-bar template, and his fretwork forms an integral part of many blues classics. Demetria’s brothers, Larry and Eddie Jr., are both well-respected recording artists, with the latter helping out on her debut with solid, dependable guitar throughout. So the lineage is impeccable indeed. And if genetics alone aren’t sufficient, Demetria remembers legends like Eddie Shaw (who also appears here), Johnny Littlejohn, and Sunnyland Slim hanging out and jamming at her father’s Chicago home. She’s literally been surrounded by the blues all her life, so it should come as no surprise that her initial offering is well within the bounds of tradition. Curiously, the disc’s liner notes make much of her determination to forge her own sound, yet the sound here is patently familiar. Most of the tunes fall into the ‘lump-de-lump’ (her description) category – the disc opens with a medley of “I’m A Woman / Hoochie Coochie Woman,” both adaptations of songs that originated as overt declarations of masculinity, and closes with the one-two punch of “Little Red Rooster” and “Wang Dang Doodle,” both composed by the prolific Willie Dixon and performed with supple yet unpretentious ease by the stellar band of veterans (both closing tunes feature additional vocals from label-mate Big Time Sarah). Indeed, the band is genuinely old-school; on hand are the likes of guitarists Shun Kikuta and the aforementioned Eddie Taylor Jr., Roosevelt Purifoy on piano and organ, with Shaw and the great Billy Branch guesting on tenor and Mississippi saxophone respectively. Together they lay down workmanlike grooves in support of Demetria’s impassioned vocals, not too far from Koko Taylor territory, with all the grit and growl the late, great Queen brought to the blues. Demetria is a vocal force to be reckoned with, and as classic Chicago blues recordings go, this one’s just fine in that gritty, working-class way – immortal compositions served up as everyday, meat ’n’ potatoes fare. It may not break new ground, but it’s reliable and dependable, and in the end, thoroughly satisfying.